Suffering an ankle sprain or pain? Ankle pain and injuries are something we see on a daily basis at the clinic. It is important to know if you have had a recent injury or if the pain has been present for a long time, as the treatment approach of each can be very different. We strive to rehab ankles as quickly and as safely as possible to get our patients back to doing things like playing sports, hill-walking or running. We treat ankle injuries every day and are experienced in not only using treatment techniques, but empowering you with all the information and advice you could need to get lasting improvement. We never "over-treat" our patients and most patients wit ankle pain get improvement within two or three visits. Our therapists are dedicated to keeping up with the latest evidence-based practice and information. Exercises, have they worked for you? If your answer is no, don't worry. Although we will give you some exercises to do at home or at the gym, this is not the only thing that we do for ankle pain. Exercises can also be incredibly hard to fit into a busy schedule, this is why we use an amazing new exercise system called Physitrack. Getting you back to normal. Although we are a clinic that treats sports injuries, we don't aim to get you doing cartwheels and backflips (unless that's your goal). We just want to get you back to where you want to be and enjoying life without worrying about pain. 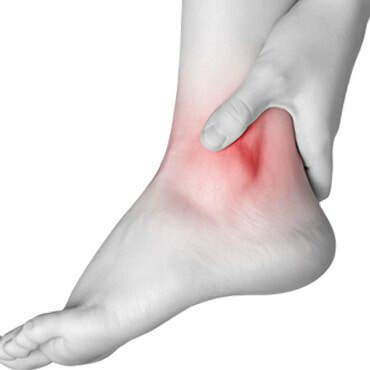 ​​If you have Ankle Pain, you should book in for a Sports Therapy/ Pain Treatment session. ​"I saw Murray as part of my preparation for a marathon when I was experiencing ankle and hip issues. I felt he was very thorough in his assessment of my challenges and provided some really solid advice. His sports massage also left me feeling extremely flexible and marathon ready! I highly recommend Murray - he knows his stuff, is clearly passionate about what he does and has a very professional and kind manner about him too, putting me at total ease. Make him your first and only call." ​"Injured my ankle at football. Went to see Murray, where he determined what it was through some of his physio-wizardry and then gave me loads of good stretches for it to get better. What could have been a long-term injury only ended up being an injury of 3 weeks. Highly Recommended!" ​"As a martial artist I find Murray's services very helpful. I like to take care of myself but over the years I've sustained a couple of nasty injuries, especially in my knee, ankle and foot. Murray helps me a lot with these injuries and gives me good advice on how to manage them. He's an all-round friendly and professional guy and his clinic is also really nice. "